This would be the crown that almost wasn't. 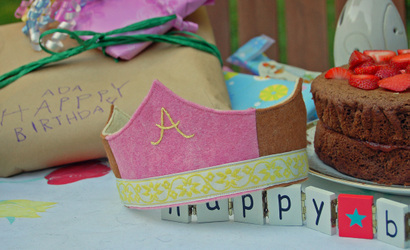 In the busyness of MY birthday celebrating I nearly forgot to make Adelaide her birthday crown, which is a very important (probably more to me than anyone else) birthday tradition in our house. Thank goodness this all came together smoothly and according to plan, albeit 11:45 pm. I only had a few small pieces of hand dyed wool felt left, so thankfully the striped pink/brown thing worked. Phew. It's lined with another layer of felt, and has elastic in the back. That "A" on the front makes me want to sqeal. I do think I need one. Funny thing about third babies. Sometimes the standards get a bit, shall we say, relaxed. 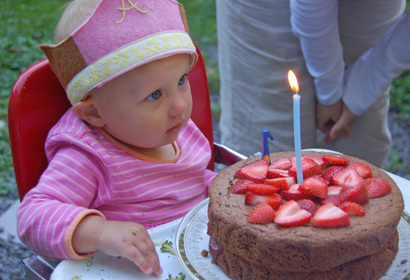 Take first birthday cakes, for example. Calvin's first birthday cake was made with tofu (no joke), Ezra got carrots, and Adelaide, well, she got the chocolate (okay, it's carob. But still!). Of course the irony, is that she had NO interest in the chocolate cake. She was mostly just pissed off that I cleared her tray of the broccoli. Go figure. So, who's birthday is it, anyway? 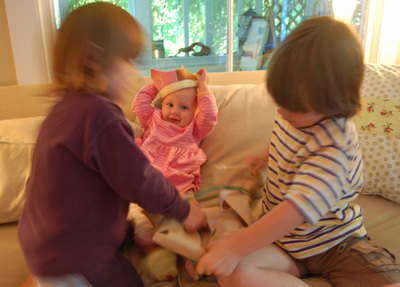 While she babbled and goofed with her crown, her brothers opened every present. You know, to help her. She hasn't developed a love of the wrapping paper yet, though I do suspect that by Solstice / Christmas, these brothers of hers are going to be out of a job. A very fun one year old birthday, for sure. Thank YOU for all her sweet well wishes and good thoughts. They'll be printed off and added to her (nearly empty...oh, the guilt) baby book. I can't believe that my baby is becoming a toddler.